Instead of building emergency temporary housing, Kiho Town rented private apartments to provide accommodation for evacuees for free for half a year. These evacuees have just started a new life in a new environment after having to leave the comfort of their own homes. 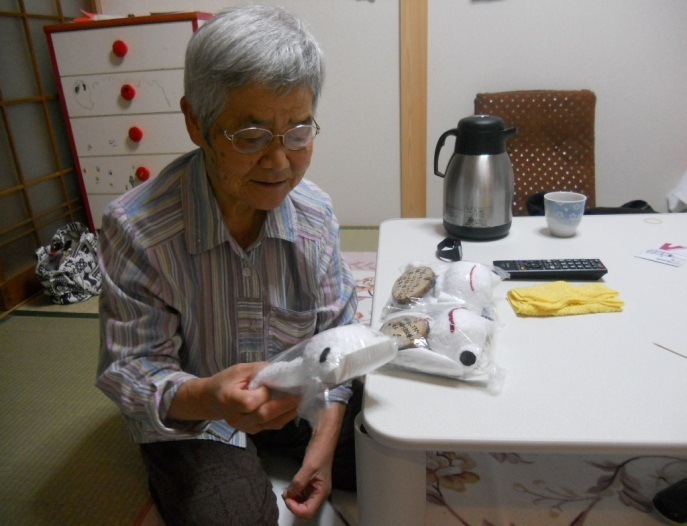 The Kiho Social Welfare Council arranged an opportunity for us to visit these evacuees at their temporary apartments to present the frog dolls to them. ・ Thank you for coming all the way from Tohoku. (Looking at a frog doll) I love making things like this, too. I came here because my house was damaged by the flood. I used to make a local specialty food, known as Nare-zushi (specific kind of sushi), and got interviewed by a newspaper. That article miraculously survived the flood. I was so happy when I found it. To make Nare-zushi, I pickle fish like saury or ayu with salt and cook soft rice. But the wooden rice tub and other cooking tools to make Nare-zushi were all damaged in the flood. Nonetheless, people around me look forward to eating my sushi, so I will make it. I had to leave my neighborhood, but two of my neighbors from there are my current next-door neighbors, so I feel at ease. Shopping is more convenient than in my old neighborhood, too. I am starting to feel I could settle down here. ・ Thank you for coming over from afar. This frog doll is so cute! I see keys can be put in it as well. Maybe it would be good to hang it in the entrance. I’m impressed how you’ve put so much thought into making this. I’m touched. ・ Wow, you’ve come from Miyagi! Thank you! Is your house OK? People in Miyagi must be having a tough time. Whether caused by tsunami or typhoon, floods are dreadful, aren’t they? I’ve finally completed moving. I don’t have to worry about flooding now, since my new house is located higher than the previous place; however, mudslide is a problem. I am anxious about it when it rains. I got volunteers to remove mud from my house. I really appreciated it. I’d never imagined that my house would be flooded. I hope we both will get by in good health. 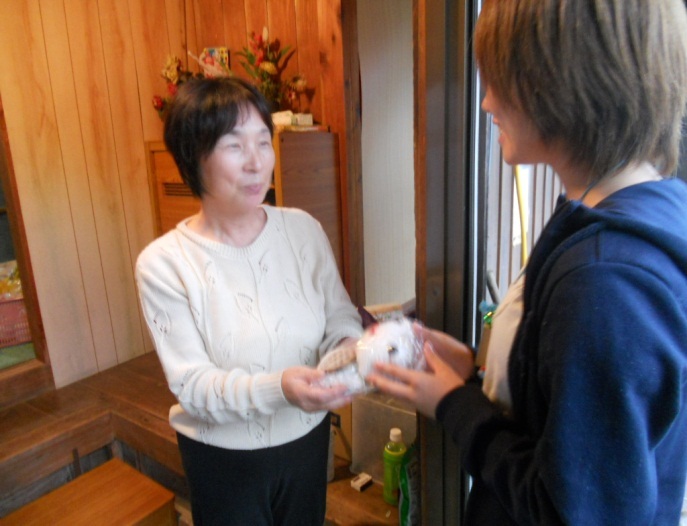 ・ My house is somehow getting cleaned up with the help of my family and relatives. My house, which is over 100 years old, was covered with mud, but it is getting cleaned up little by little. But I still can’t live in my house, so I’ve come here. This frog doll is cute! Thank you! Victims of the typhoons in Kiho Town said to me, “Our damage is much smaller and not comparable to yours in Tohoku" . I think, however, no matter how big and severe, it is important to share the spirit of saying, “Let’s hang in there and not give up!” I really found the Kiho residents to be thoughtful and considerate. When they looked at the frog dolls, everyone said, “It is cute!” with a smile, so I was happy to hand out the dolls to them in person. In Tohoku, news of the typhoons No.12 and No. 15 is not broadcast any longer. The opportunity to visit Kiho and to hear people’s real voices was an invaluable experience for me. Two months have passed since the typhoons. Kiho is in the middle of restoration just like Shichigahama. 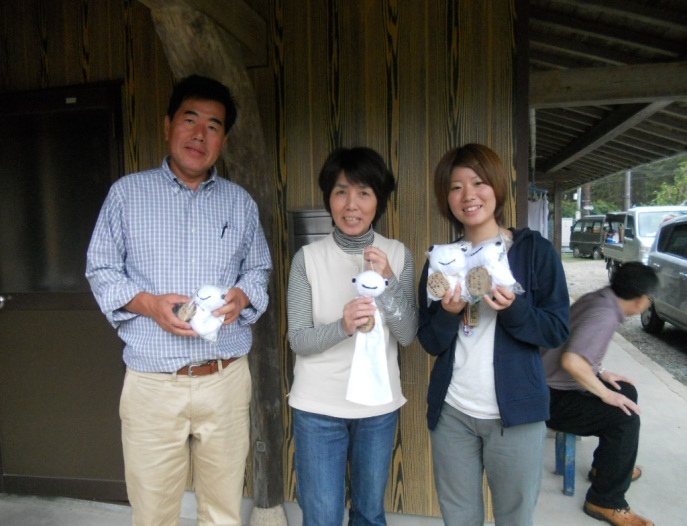 The frog dolls have connected people in Shichigahama and in Kiho through mutual care and understanding. They also brought a smile to residents in Kiho. Residents in Shichigahama must be happy to know this. RSY will continue to help strengthen this tie. In closing, regarding this effort, I would like to sincerely thank Shichigahama Disaster Volunteer Center, its citizens, Kiho Social Welfare Council, CO-OP AICHI who provided us with towels as material for making the frog dolls, RSY members and volunteers, for their considerable support. Hope the frog doll can bring some sunshine to the people in Tohoku!! !